I missed the memo about carry over cooking. Ya’ll might recall that I once had an epiphany about meatloaf while watching Good Eats. My ardor for Alton Brown deepened when he delivered a memo about carry over cooking. You see, I thought I knew how to make scrambled eggs, but my beloved AB taught me something that I have been meditating on for years since: If the eggs are done in the pan, then they’re overdone on the plate. 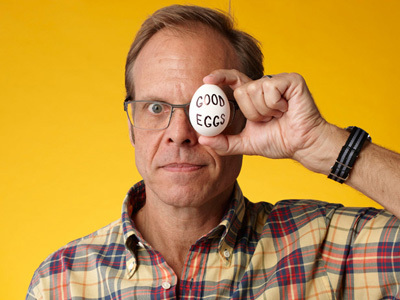 Alton Brown, the Zen master of breakfast. Let that sink in for a second. I had never really grasped the concept of carry over cooking before, but Alton’s gorgeous egg illustration really sunk in. For the uninitiated, here’s a simple definition: Carry over cooking refers to the phenomenon that food retains heat and continues to cook even after being removed from the source of heat. To develop any finesse in the kitchen, you have to account for carry over cooking. It might seem counter-intuitive, but you remove the food from the fire when it is just a little undercooked. It’s like driving downhill and killing the engine, knowing that you’ll have just enough momentum to coast into your driveway. Once you figure it out, you have the faith in the in the physics of the situation. The other thing about carry over cooking is that you have to have the restraint not to dive in and eat straight out of the pan. You have to step back and leave everything alone. Maybe, throw a piece of aluminum foil over everything, and then just walk away. Because it allows me to indulge my very wholesome thoughts about Alton Brown, I think about carry over cooking just about every time I scramble up some eggs. And recently, I got to thinking about how the principles behind carry over cooking might apply more universally. I’ve talked before about my issues with control, and carry over cooking is a beautiful illustration of how a little surrender and a little patience are richly rewarded. I can’t totally control the molecular changes in eggs that transform them from slimy soup to fluffy goodness…I have to back off and trust that if I gently guide the process most of the way, I can then step back and the rest will take care of itself. I’d vote for that guy. Turning off the heat and memo received. Fantastic!!! Thanks for the lesson. Thanks, Sheila! Hope your eggs and your Election Day both turn out just as you want them to! I love AB, too. I’ve learned about carry over cooking and resting meat. Love getting new brain wrinkles. Umm…..took my beef roast out at 155…thinking it’d go to 160 at least (DH wants meats well done..sadly). Nope. Dropped from 155 according to the thermometer. So much for carryover cooking. Although I LOVE Alton, I don’t belive in carryover cooking….for roast beef. at least.